I just realized that it's almost the end of February and I haven't made my Christmas cards for this month. For those of you who don't remember my post from last month, I joined a challenge to make 5-10 Christmas cards every month this year. By the beginning of December I'll have all of my cards stamped and ready to send. While looking for inspiration for my card, I found this wonderful Verve sketch. I'm a huge fan of Julee's sketches and I love her stamps too. So I thought it was only fitting to ink up Julee's "Snow Wonderful" Verve stamp set for the challenge. As you can see in the sketch above this was a two-fold challenge. Not only were you supposed to use the sketch for your card, you were also supposed to use embossing. I inked up the snowflake background stamp with Versamark ink and stamped it on my Baja Breeze cardstock. Once I had filled the piece of cardstock with snowflakes, I embossed it with Whisper White Embossing Powder. The snowman was also embossed with Black Embossing Powder. I cut him out with my Oval Nestabilities and then layered him on a Scalloped Oval. I sponged the area around the snowman with some Baja Breeze ink. It's difficult to see in the photo, but there are six half-back pearls on this card. I wanted to stay true to the sketch so I added the pearls right where they're picture on the sketch. For the inside of my card I stamped my sentiment and embossed it with Whisper White Embossing Powder. It's Wednesday and you know what that means....another Diva Coffee Break Designs (DCBD) challenge. Guess what? We started our own blog!!! Click on over and check it out. Heidi and Julie have worked very hard putting this together for the team. While you're there, you can add the DCBD blog to your blog reader or sign up to receive updates through email. You'll also notice that we added 13 new design team members to the group. We have some fun new challenges (and prizes!) in the works and we hope you'll join in the fun. So, are you ready to see this week's challenge? I decided to combine this color challenge with Julee's Mojo Monday sketch. All of the Tempting Turquoise paper came from the Pink Flamingo designer series paper. It's such a striking color to use with Whisper White and Basic Gray. I love the combination. Green Galore, on the other hand, is a color I seldom touch so this truly was a challenge for me. I decided to keep it to a minimum by only adding a Green Galore flower. I took one of the small white flowers from the Pretties Kit and colored it with my Green Galore marker. Next I took my Aqua Painter and brushed water over the flower to dilute the color so it wouldn't be so bright. I used a Clear Rhinestone Brad to hold the two flowers together and attached them to the card with Mini Glue Dots. I used the Paper Piercing Template to help me line up all of the holes for the Silver Brads. I pierced a hole in every third hole in the template. I was pleased to see that it gave me exactly seven brads just like Julee has in the sketch. I finished the front of my card with lots of sewing and some of our gorgeous Whisper White Organza Ribbon. Like always, I kept the inside of my card very simple. The white lines on the DSP is another piece of Whisper White Organza ribbon. I only wish I could have tied a bow in the ribbon, but then the card wouldn't close right. After a couple of days off, my stamping mojo needed a little warm-up today. So I decided to make a set of 3 x3 cards. They're so quick and easy to make and it really helps me get in the mood to stamp again. I used my Scallop Edge punch to scallop the bottom edge of my card. Then I added a piece of DSP to the inside of my card behind the scallops. I added some ribbon and some punched pieces of cardstock and I have a cute birthday card ready to go. All of these cards use stamped images from the Darling Dots hostess stamp set. You can't tell from the photo, but the heart image is cut out and popped up on dimensionals. The sentiment on this card comes from the Chit Chat Rub-ons. This was the quickest of all the cards I made. A strip of DSP, some ribbon, another Rub-on, and a stamped present punched out with the Wide Oval punch. I don't have a new project to show you today because I'm fighting a cold. My head is too stuffy to think straight. I just want to curl up under a blanket with a good book and rest today. I did, however, want to stop by and post a few blog awards I've received recently. Kristin gave this award to all of us on the Diva Coffee Break Design Team. I love being a part of this team. I enjoy blog hopping each Wednesday to see what they come up with for the challenges. We all leave each other comments too. It's a lot of fun. Anne gave me this award. Isn't that cute? Anne's blog is in French (she speaks very little English), but you can still visit her blog and see her cute stamping ideas. Angji gave me the lemonade award. This award is given to bloggers who show great attitude and/or gratitude. Yesterday I participated in another sketch challenge on SUDSOL. I don't have a copy of the original sketch that we used for inspiration, but here's the card I made for the challenge. I decided to use the Baroque Motifs stamp set and, once again, make it a black and white card with a splash of another color. All of the swirls were stamped in Basic Black Craft ink and embossed with Clear Embossing Powder. I wanted to emboss the flower too, but Stampin' Up! doesn't make a Riding Hood Red Craft ink pad. To get around this, I inked the flower in Versamark ink and then inked it on the Riding Hood Red Classic ink pad. After I stamped it on my cardstock I embossed it with Clear Embossing Powder. This is an easy way to be able to emboss in any color ink pad you have. I used Shimmery White cardstock for this card. As you can see in the photo (click on the photo for a larger view), it really shimmers and shines. I used the same basic layout for the inside of my card. I embossed part of a swirl in the corner and then added an embossed flower on top. It's Wednesday and you know what that means...another Diva Coffee Break Design challenge! This week we had this great sketch to work with. I decided to use my Bella Rose DSP for this card. I love the patterns on the paper and it's one of my favorite color combinations. For my main image I made a chrysanthemum using my 5-petal Flower punch. Click here to see a tutorial on how to make this flower. I punched the flowers out of Pretty in Pink cardstock and sponged all of the edges in Regal Rose ink. I took my 1/2" Circle punch and punched a small flower image from a piece of Raspberry Tart DSP. I adhered it to a build-a-brad, added the bubble to the top, and attached the brad to the center of my flower. I added a couple of layers of cardstock and DSP to the inside of my card. I finished it by stamping the hummingbird (from the Dream a Little Hostess set) in Rose Red ink. If you'd like to join the challenge, simply create your own card using the sketch challenge above. Come back here and leave a comment so I can check out your creation. If you upload your card to SplitCoast, please use the keyword DCBD115. Be sure to check out the blogs of the other design team members to see their creations. It's Tuesday and I have another Mojo Monday card for you a day late. Week after week Julee comes up with the best layouts. She's amazing! This is the new Pink Flamingo DSP. At first I was hesitant to purchase it because it has such bold, bright colors. Cameo Coral, Summer Sun, Real Red, and Tempting Turquoise...talk about bright! I decided to tone the paper down a little bit by just using the red and pink colors together. The flower images are from the Best Wishes & More stamp set. I stamped the flowers in Real Red and Cameo Coral Craft ink and then embossed them with Clear Embossing Powder. I popped the two Cameo Coral flowers up on Dimensionals. I used my Janome Sew Mini to sew around all of the square/rectangle layers on my card. I didn't want to attempt trying to sew around the circle layer, so I added some paper piercing below the words "let's celebrate!" instead. I kept the inside of my card pretty simple. I sponged around the edges of the Whisper White cardstock with Real Red ink, added an Eyelet Border to my DSP, and added some Real Red Wide Grosgrain. Happy Valentine's Day! After two very busy days I'm looking forward to having a nice relaxing day today. This morning I found out that this card I made was featured on the Stamper's Showcase today. How exciting is that?! For those of you who don't know, Stamper's Showcase is a card gallery featured on the demonstrator only side of the Stampin' Up! website. If you'd like more details on this card, you can find them by clicking here. Throughout the school year I enjoy making hand-stamped gift for my children's teachers. I know that teachers are always in need of thank you cards so I decided to make a set for each teacher for Valentine's Day. The layout for my card came from Valerie Stangle. I loved the Christmas card she made using this layout. If you're anything like me, you have a huge stash of retired designer series paper (DSP). I can't seem to use it all up. So I pulled out some retired Georgia Peach DSP and used it to make my cards. You can substitute the Georgia Peach DSP with the Washington Apple DSP that's still in the current catalog. Both packs of DSP have the same layout and design, they just have different color schemes. The So Saffron ribbon is from the Ribbon Bundle that you can get for free through the Sale-a-bration promotion. The layout and design of this card is so simple that I think the rest of the card is pretty self-explanatory. Are you ready for another Diva Coffee Break Design challenge? This week Heidi gave us this fun color combination to work with. I looked through my file of card sketches and found this fun sketch from Julee. I combined the two and came up with this card. I stamped the large flower image three times, cut out the different layers, and adhered them on top of each other using dimensionals. I love the depth dimensionals add to the flower. I finished off each of the flowers with a half-back pearl from the Pretties Kit. I also added three more pearls on the bottom corner of the card. I wanted to add a little bit of green behind the flower, so I used the leaf image from the "Dream a Little" hostess set. Isn't this ribbon gorgeous? This is the new Whisper White Organza ribbon. 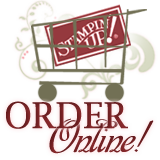 I hope Stampin' Up! has more organza ribbon in different colors in the next catalog. For the inside of my card I thought I would imitate the look of the main image panel on the front of the card. I stamped the leaves, stamped and layered the flower, scalloped the edge of the cardstock, and adhered it all together. I flipped over the Always Artichoke cardstock, added adhesive to the back and then adhered it to the inside of my card. That's when it hit me...it's mostly pink on pink. OOPS! I should have made the center panel Almost Amethyst. By then it was too late because I already had the entire card made and I didn't have time to redo it. Just learn from my mistake! Back in November I used this same sketch to make a similar card using the Abundant Blessings stamp set from Verve. Click here to see the card that inspired the card I made today. If you'd like to join the challenge, simply create your own card using the color challenge above. Come back here and leave a comment so I can check out your creation. If you upload your card to SplitCoast, please use the keyword DCBD114. Be sure to check out the blogs of the other design team members to see their creations.